World Vision Australia supports a Local Value Chain Development Market Facilitation Project Model which helps producers increase their incomes through better engagement with markets and by building relationships with service providers that can help them overcome market barriers. 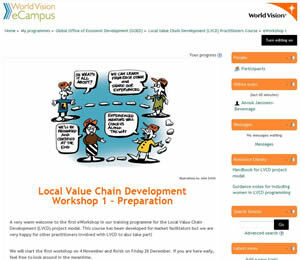 A key component of the LVCD project model is the position of the Market Facilitator. The programme supports many groups in selected African and Asian countries, with new groups/localities being added constantly. The geographical distribution, the remoteness of the projects and the multiple time-frames of the supported groups are some of the most important challenges to providing continuous training and assistance to the Market Facilitators. 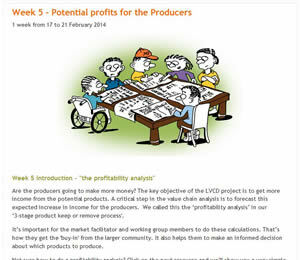 It would be too expensive to train Market Facilitators in face-to-face workshops. It would also be inefficient because in fact they need just-in-time access to technical support and training. There are also no right/wrong answers. The way LVCD is implemented is highly dependent on local situations. There are many LVCD handbooks available, but packaged learning is only valuable up to a certain extent. Market facilitators need to be able to bring their own stories, challenges and solutions to the learning space – together they need to be able to construct knowledge that makes sense to them and their environment. Market Facilitators have in the past reported that the level of isolation hampers their capability to adequately support their communities. In the training needs analysis they reported that it would add tremendous value if Market Facilitators from different sectors, regions and countries could learn with and from each other. A global collaborative support structure is considered essential for all people involved. Webinars are not an option because of erratic access to internet. Almost all Market Facilitators have some level of internet access, usually some time during the day, but it is impossible to know when. Power cuts are also a factor. World Vision uses a new approach to learning which is called PALS (Project model Accredited Learning and Support). PALS has been developed to recognise, by means of accreditation, the continuous on-the-job learning and achievements that occur in the field every day. From April 2013 DynaMind eLearning has been working with the Melbourne-based Social Entrepreneurship and Economic Development (SEED) Unit to conceptualise, develop and implement an e-learning solution (for Asia/Africa) that would continuously support the Market Facilitators in this programme, including those in remote locations with considerable digital challenges. It was clear from the start of this project that the support should go well beyond the transfer of information, tips and lessons learned. Collaboration and real life problem-solving had to be a key part of a user-driven programme, supported by expert facilitators. It was decided that the most appropriate solution was to facilitate a number of eWorkshops and provide an online meeting space linked to the workshop spaces which in turn allows for continuous community building and support outside the scheduled workshop weeks. We have used the eWorkshop model in a number of similar projects with excellent results. It was used for much larger target groups – so it has been proven to be scalable. All Market Facilitators involved in the programme learn together over a period of 8 months while staying on their respective jobs. Multiple training cycles support the growing numbers of staff. They join a series of 5 eWorkshops organised at regular intervals in which they engage in problem-based learning tailored to their specific needs. Market Facilitators don’t just talk about LVCD, they solve typical LVCD problems together in teams. We provided key instructional design support and training to ensure the team activities are inspiring and engaging as well as expertly organised to work well in online learning environments. All interactions are asynchronous (with sporadic Skype support) to cater for multiple time zones, varied work commitments and low internet reliability. The type of online learning design and innovative approach to e-facilitation promotes strong bonding and collaborative work, as well as the nurturing of a strong group dynamic. This in turn addresses the problem of isolation experienced in past capacity development programmes. The eWorkshops are offered on a Moodle platform. The version used is accessible on smart phones and tablets. All activities and resources are designed to work on limited bandwidth and/or offline as well. 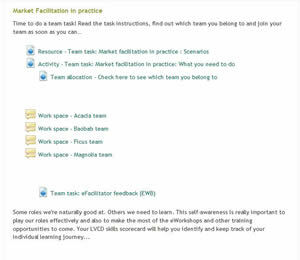 The team of e-facilitators have undertaken the tailored e-facilitation training offered by DynaMind. Available LVCD resources were re-used and considerable work was done on simplifying the language (for ESL speakers), adding many real-life scenarios and story-telling for the activities. The focus is on doing LVCD. The LVCD capacity building programme for Market Facilitators was launched in September 2013 and will be running for at least another 3 years. Additional eWorkshops and other e-learning resources are currently being developed. The initial feedback is very positive and all Market Facilitators actively participate in the workshops with many reporting direct impact on their day-to-day work. 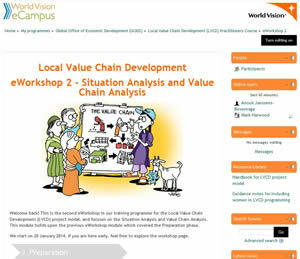 World Vision is now considering using the same model of training for multiple other projects with similar challenges.